The Claudia Sofa bed from Gainsborough forms part of a new contempory range of sofa beds to rival the sofabed choice range with more compact sizes and deeper more plump cushions. 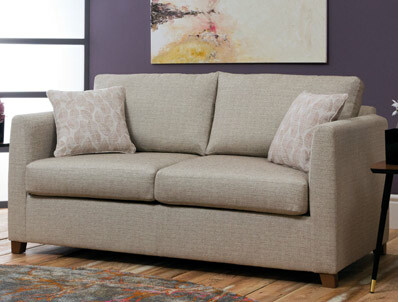 The Claudia sofa bed pictured is a compact 3 seater sofa in A292 carcas fabric and s306 scatter cushion fabric . Like all Gainsborough Sofa beds the Claudia is available in 2 other sizes as well a 2.5 seater sofa bed and a Large 3 seater sofa bed , please note because of the size of the large 3 seater sofa bed the candice is supplied with bolt on arms and will be re assembled by the delivery company in your home. 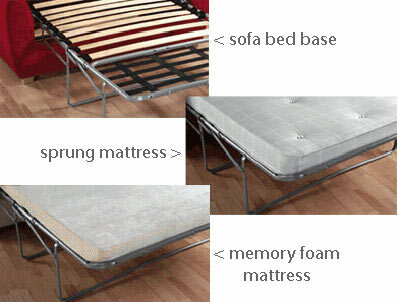 The frame of the sofa bed is a standard 2 action folding mechanism and comes as standard with a coil spring mattress , but can be upgraded to a memory foam or pocket spring mattress. There are 2 ranges of fabrics for the sofa bed P & A are one standard price where as B are a upgrade price , the sofa bed comes as standard with a pair of scatter cushions.